It can be easy to delay starting something if you're feeling down. Everyone needs time to feel a little depressed, savour and wallow in the sheer listlessness of a day or two (while binge watching Arrested Development, Breaking Bad or perhaps the Wire, because everyone has told you to), but if you can't recover after a week it's likely you are just lazy or should seek professional help. I just survived 7 months of Edmonton winter so that I can enjoy 23 straight days of rain, and now a heat wave, and I've been feeling down. Maybe that's why I have been procrastinating several things these past few months. I still haven't written articles to analyze the finals of the Brier or the Worlds (much less the Grand Slam final from December). 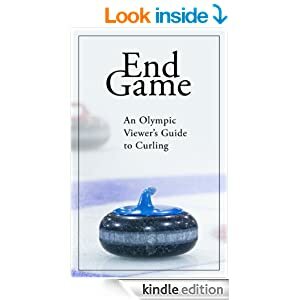 I'd like to write an e-book before the Olympics, but haven't gotten much past the Table of Contents. I started to clean out my garage (but haven't finished), which means it is so cluttered with things to throw out, things to sell (anyone want a Little Tikes Basketball Hoop? ), and just plain things, that it cannot be inhabited by vehicles. My office is still in a state of "nearly finished organzining". And my 2012 Taxes are at least piled together, and have managed not to spontaneously combust in this unusual Central Alberta heat. There's likely a half dozen other things I'm putting off doing but it's been so long that their importance has worn off and the likelyhood of ever doing them is coming into question. But I had been watching Sunday Night TV (Game of Thrones/Mad Men), Arrested Development, and the NBA and NHL Playoffs. And now they are all done. No more excuses. At my age it seems unrealistic that I can use the devastating 6th game loss by my Bruins as an excuse (my father was a Habs fan, and we are both devils advocates, so it was natural). The manner in which it took place, losing in the final 80+ seconds, was dumbfounding, but I'm still proud of the season, the team, and mostly disappointed we were deprived a seventh game, win or lose. Of course, we did see over 7 games of hockey if you include the extra three periods of game 1. Memories of Petr Klima in '91 and the famous play-off battle between the Capitals vs Islanders from 1987, which at 15 I stayed up to watch, caring little for which team won but knowing it would somehow matter. And now I realize it doesn't. The NBA playoffs treated us to a seventh game, and though it was hard fought and close to the end, it fell short of what may go down as one of the best finals games ever in game 6. As I started to pull for different players and teams throughout each play-offs, I constantly remind myself, as a grown man who has reached the limits of his own disappointments, that the losers still make enough money to get by allright. Curlers, on the other hand, are still working towards a higher level of fame and fortune. For some, reaching the Olympic level can also mean being held to the same standards of other athletes when it comes to PEDs. Ask Jacobs fifth man Matt Dumontelle how it feels after being surprised with a 2 year suspension. What a bunch of horse droppings. Experts, from many sports, continually stay ahead of the system and those that get caught are most often either because of stupid mistakes or unaware of the correct application of the rules. I only wonder what the outcome may have been at the World's if Matt had played. In our Around The House podcast with Stoughton third Jon Mead, we were told that most of their team was battling sickness during their provincial final weekend, but couldn't take many over the counter substances because they could be considered PEDs. Once again, horse droppings. If you read the article, you'll notice the rest of the Jacobs team "remain friends" with Matt but in "no way condone his actions". I expect these comments fall in the category of, say what you are expected to say so the governing bodies don't get angry, rather than what you really think. I certainly don't know anything further than the article states, and maybe I'm off base, but I doubt that anyone was trying to gain an edge on the ice. The punishment also seems severe. A 2 year ban within Canadian competition? I for one would like to think Canada could use a more minor punishment for a first time offender, especially if what was taken is legal (maybe in Matt's case it wasn't?). For a sport that was built (and sponsored) by cigarettes, beer, and the occasional CC and coke, it seems a travesty that Joe Frans gets a 2 year ban for experimenting with coca plants and Matt gets the same for his actions. Maybe the CCA had little choice, they are governed by larger entities, but regardless of how this penalty is determined, if you examine all the factors, and also admire the feats of other great athletes who actually benefit from PEDs, and don't get caught, it all appears ridiculous.